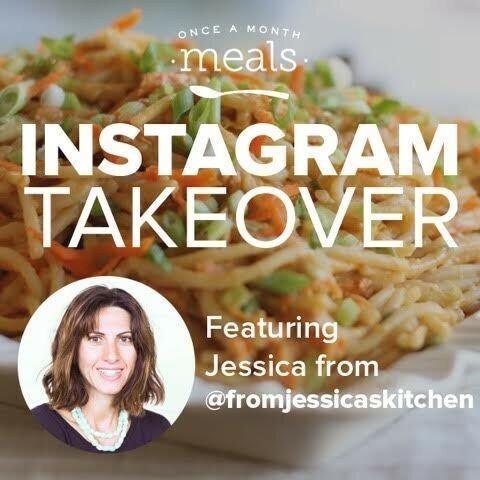 Before I talk about this fried rice we had (and now obsessed with) for dinner, I want to share some exciting news with you — I’m partnering with Once a Month Meals THIS weekend, May 20-22, for their Virtual Cooking Weekend, with an Instagram Takeover starting Wednesday morning!!!! For those of you not familiar with this concept, what that means is I will be taking over their Instagram account (find them @onceamonthmeals, like now!) where I will be cooking and sharing tips. Then more over on their Facebook page through the weekend, so be sure to come check it out!! You know how life can get so busy that before you know it it’s dinner time? Um, yeah, been there done that, and I’m a food blogger for goodness sake. Well, the folks over at Once a Month Meals know how to do monthly meal planning efficiently, and they’ll definitely help you free up your time. They offer many dietary menus based on needs and preferences for a month’s worth of meals to freeze and they walk you through the whole process, offering plenty of tips along the way before the actual cooking weekend, so it’s a stress-free experience. They even have toddler and baby menus for new Moms, how cool is that? I was thrilled when they asked me to partner up with them for this months’ Allergy Awareness and Celiac Awareness Month and thought how fun would it be to do this with them and would love for you to come cook or hang out there with us! What’s nice about planning and cooking ahead in one weekend is having a freezer full of meals for the month. Amen to that. 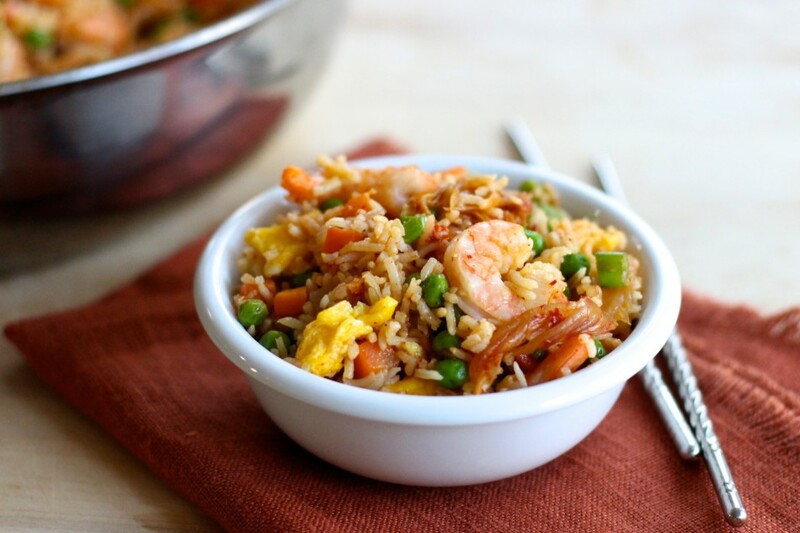 Fried rice, in the Chinese-American tradition, is typically prepared with lots of sauce and big chunks of protein, whereas in more authentic Chinese restaurants it is typically seasoned with nothing more than salt and a little sauce. 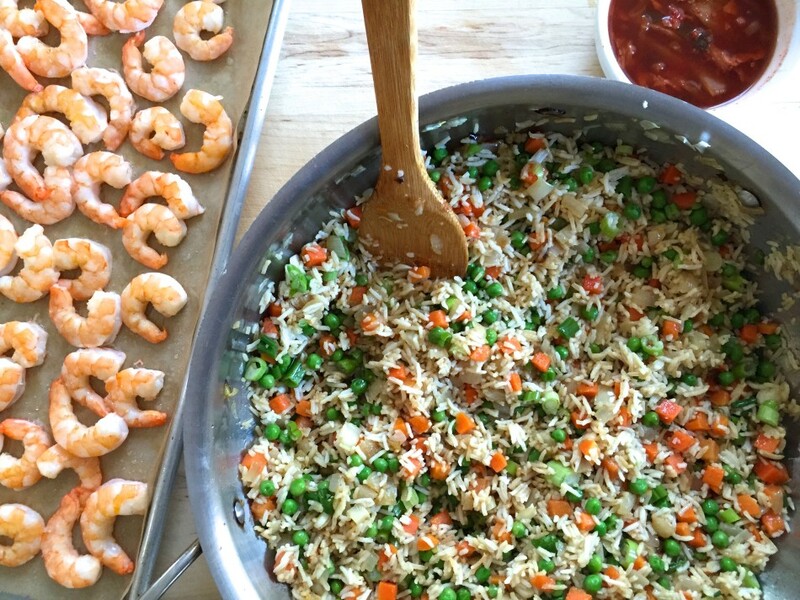 My version is a little bit of both – some big chunks of shrimp for protein and minimal sauce. Oh, and homemade kimchi because kimchi makes everything taste better. Take that takeout food. Ha. I used jasmine rice (a medium-grain rice) for its’ aromatics instead of Chinese medium-grain or sushi rice. 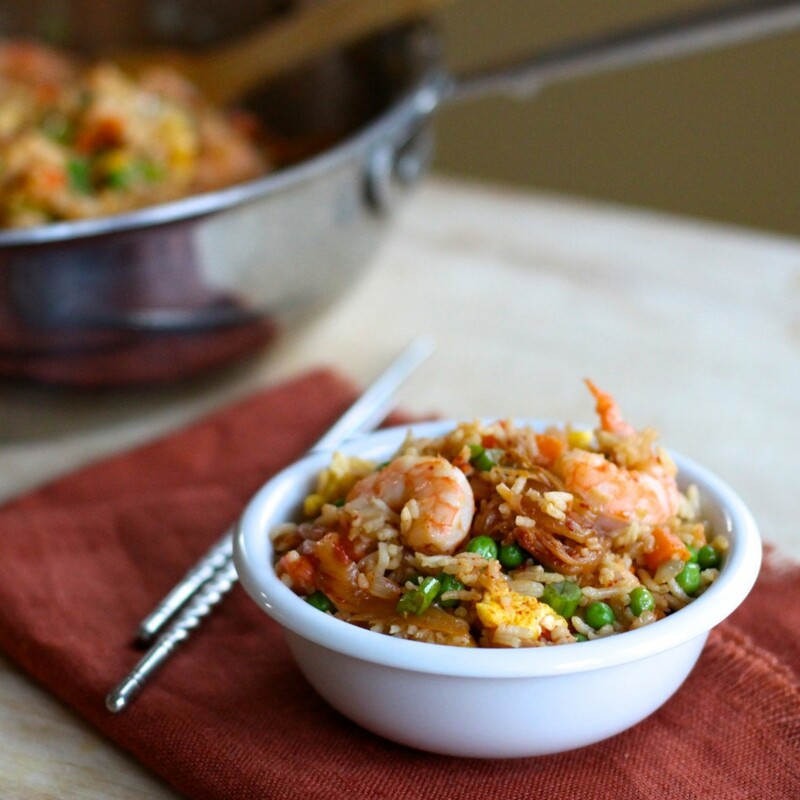 It has the perfect balance of stickiness you want in a fried rice without all the starch that can quickly turn it clumpy and more difficult to stir-fry. It’s a recipe I adapted from Serious Eats and it is the real deal, aka, zero mush. What’s nice about making a big pan full is leftovers for lunch and it’s freezer-friendly too, which is why I make loads of it. If you’re using day or two old rice, you know how dry that can be so a good de-clumping by hand, before stir-frying, will give you the best results. I can just imagine my boys’ reactions when they see this stashed in their lunch boxes. Hmm, maybe I can get a back massage for this one? So easy and more flavorful than take-out with kimchi add in. Don't like shrimp? Swap it out for your favorite protein or make it a meatless. Either way, it's a wonderful weeknight meal or side - makes a great leftover lunch too! Preheat oven temperature to 400 degrees F. Line a rimmed baking sheet with parchment paper. If shrimp has not been cleaned by your fishmonger, devein and remove shells then transfer to lined baking sheet and roast for 7-10 minutes, until opaque and bright pink. Set aside for later. Meanwhile, fill a medium saucepan with 3 cups of water then set on medium-high heat. When boiling, add 1 tablespoon kosher salt and jasmine rice. Reduce heat to low/simmer and cover tightly. Cook for 20-25 or until water has evaporated and little air holes appear throughout the rice. Set aside. Meanwhile, for the eggs: crack eggs into a small bowl and whisk with a fork. Set a small skillet <g class="gr_ gr_60 gr-alert gr_gramm gr_run_anim Grammar multiReplace" id="60" data-gr-id="60">on</g> medium heat, when hot add 2 tablespoons oil. Slowly pour in whisked eggs and let it sit for a few seconds. When the ends begin to solidify, slowly push them into the center and continue to push wet eggs throughout for another minute. Eggs should appear wet, but look like a scramble and will continue to cook when added to the fried rice. Transfer to a plate and set aside (do not leave in the skillet, it will continue to cook and toughen eggs). Heat a wok or heavy bottomed large sauté pan over high heat. Add 1 tablespoon oil, when hot add diced onions and stir around to coat well until it appears soft and opaque, about 2 minutes. Transfer onions to a plate and set aside. Set pan back on high heat. When it gets very hot and begins to smoke, add remaining 2 tablespoons of oil then 1/3 of the total cooked rice and toss around with a sturdy metal spatula (wooden spoons tend to stick and clump rice), cook for a minute then add another 1/3 of the rice to do the same and then the remaining rice. This should all be fairly quick, about 2-3 minutes. Adding it in all at once will reduce the heat of the pan resulting in solid clumps of mushy rice. Add in sesame oil, rice wine vinegar, coconut sugar, and kosher salt. Toss to combine well. Rice will begin to sizzle when liquid ingredients have been added, at this point add in scallions, frozen peas/carrots and roasted shrimp. Combine well until frozen vegetables appear cooked, then toss in scrambled eggs and kimchi to combine for another minute or two until heated through. Serve hot or warm. 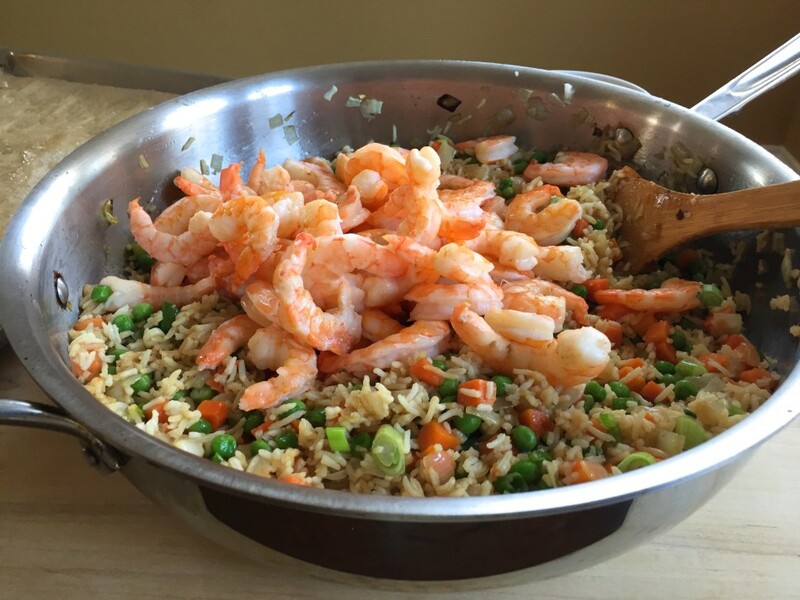 Shrimp fried rice can stay fresh refrigerated for 3 days and freezes well for up to 2 months in a vacuum-sealed bag or freezer-safe container. Alternatively, you can swap out shrimp for chicken, pork or beef flank strips or leave out and make it meatless. That sounds like lots of fun Jessica! I have always loved pork fried rice but don't feel good when I eat it, wondering if I cannot tolerate soy. This looks really good and healthy!! Congrats!! Kimchi in fried rice? Yes! Looks delicious and filling! 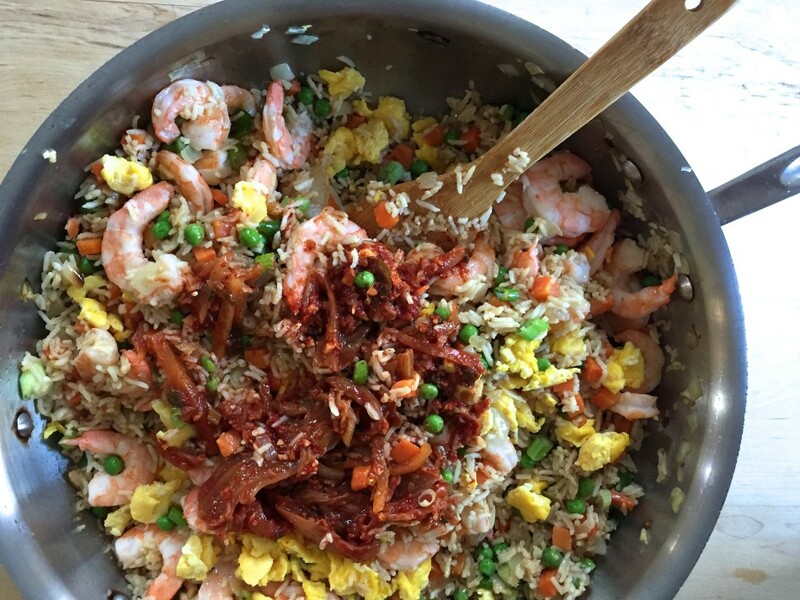 Some fried rice is not much more than rice and peas with a tiny amount of egg. How did your son who cannot eat eggs have it? Thanks Kim!! Hope you enjoy! Good for you! Made your kimchi before and loved it, need to make it again for this. Anything with rice is well received at my house lol! Thanks Cyndy!! Isn't it so good? We love it in everything. Us too, rice and carbs are what my boys (okay and me) want most nights. I've tried to make fried rice before but it came out mushy. I read your recipe and see you wrote should be done is batches now I see why. Looking forward to trying this. Thank you. Yes, it's a couple of extra steps but really worth it since home ovens don't get nearly as hot as commercial woks. Let me know what you think! This looks wonderful but my husband can't eat shrimp. I would like to make it with chicken. Do you think leftover chicken shredded and without skin would be good for this recipe? Great way to use leftover chicken Stacey! I would rub a little oil into the shredded chicken and give it a pinch of salt before adding it to the recipe. Let me know how it turns out, enjoy! Hi Jessica, Thanks for the recipe, trying it tonight! I have 2 small girls with dairy (milk protein) and soy allergies so I love finding recipes that don't use butter, cow's milk, vegetable oil or cheese! It has been a long road but fortunately (for me) there is now a lot of other people out there that avoid these ingredients. It has certainly changed our way of eating and opened our eyes to so many things that can be in our food. I have been making my own version of chicken or steak fried rice just from going to Japanese steakhouses...I said Hey I can do that! My girls and husband love shrimp so I am looking forward to trying this out. I also like that you use avocado oil 👍 Thanks again! Hi Michelle, thanks for visiting! Definitely, a long road when dealing with food allergies, I couldn't agree more, and also love recreating food from out at home. I love that. :) Hope you enjoyed the recipe and find more recipes that your family will enjoy!! We had this for dinner tonight and what a treat it was. 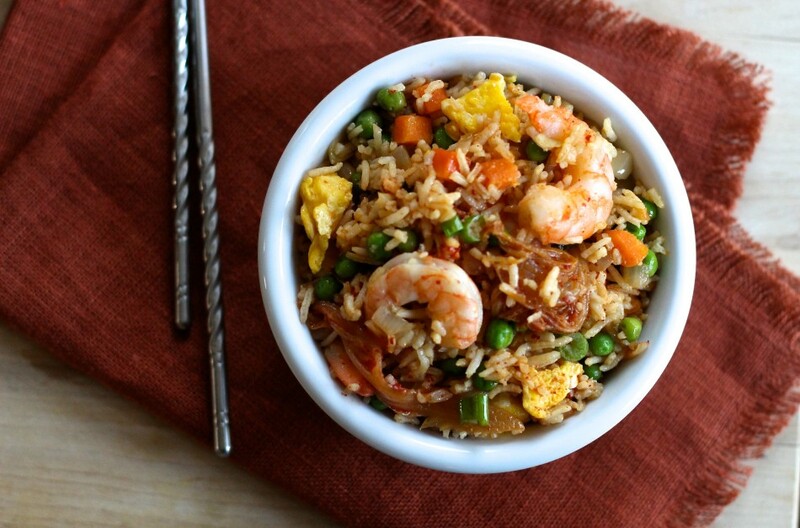 I have missed out on fried rice with shrimp for sometime being gluten and soy free. Finally a soy free shrimp fried rice that's tasty...thank you!